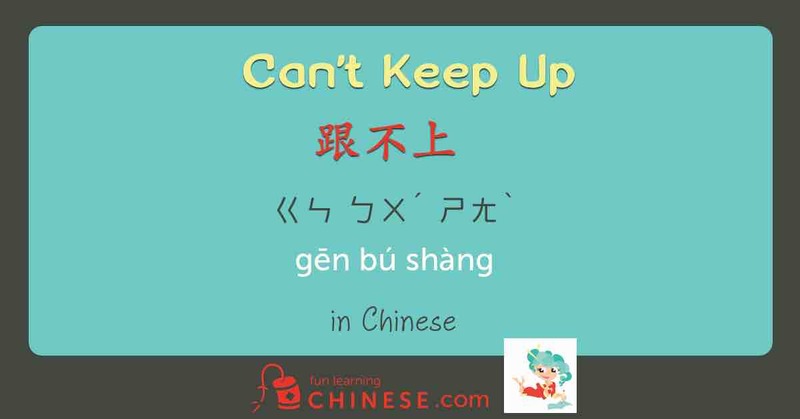 One of the meanings of 跟 (see pronunciation and definitions below) has to do with ‘following closely.’ When you add 不 and 上 after it, it means you can’t keep up. The sequence of tones (first tone ⇾ second tone ⇾ fourth tone) make it particularly easy to say and fit with the emotion of someone who is struggling with keeping up. Since I frequently can’t keep up with my husband or kids, I had some fun using this phrase in the sentences below. But first some vocabulary that is relatively new to me or unique to these sentences. My husband runs quite a bit faster than I do. I often can’t keep up. However, my husband is very considerate. He always finds a way to help me follow closely behind him. he just waits a moment. Sometimes he points out which way to go, so just in case I get lost I will know where to go. he very considerately keeps an eye on me. Argh! I again can’t keep up! Fortunately, they will all wait for me. Now our young, energetic puppy also runs much faster than me. If I don’t have a leash restricting it, I certainly can’t keep up! Don’t tell me that even in this I can’t keep up!? ❶ Although the more literal translation of 能 ㄋㄥˊ (néng) is can, to be able, in this context it means that ‘somehow to figure out’. ❷ A common abbreviation for “measure word”. ❸ This word is very literal in its use of characters, using the character 指 for finger plus the character 點 that means dot or point. ❹ Just to clarify, I used my normal character + character notation for explaining the meaning here. So the character that means 10,000 put together with the character that means 1 is like saying one in a million chance, or ‘just in case’. 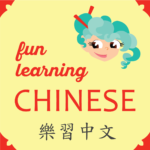 ❺ In English we say ‘where to go’, but in Chinese the turn of phrase is ‘how to go’. ❻ The 看 in this word uses the first tone, as opposed to the fourth tone when using it for the common definitions of to see, to look at, to watch, and to read. By making it a first tone, it gives the meaning of looking after and taking care of kind of watching. ❼ Technically, the translation is “dog chain,” but like many times in English, although the material something is made out of changes, the word for it does not always change. ❽ Just a reminder that the pronoun for animals is gender neutral. ❾ The literal translation for these characters is “difficult path or way”.